Tape measures are devices that should complete your toolkit. 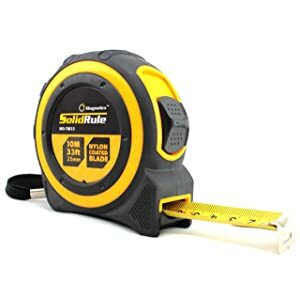 Regardless of whether you are a hobbyist, an apprentice construction worker or an experienced seasoned pro, you will use a tape measure on an everyday basis. The tool will help you get exact measurements of nearly everything on your project. How to Choose a Tape Measure? This tool has received a lot of attention to details, during its design and manufacturing stages. Why, because there is no significant amendment done to it, since its introduction to the market in 1963 up to the present time. The built-in features will show you why making major improvements to this tool is never necessary. For example, the case is made from high-quality ABS plastic that gives its inside workings high impact protection. Then you have the 1-1/4” measuring tape, which is Mylar polyester that adds to its toughness and flexibility. It also has the support of a heat-treated spring, providing it a longer life span. And last but not least for the tape, it has a True-Zero hook at the end to allow you to make accurate measurements. 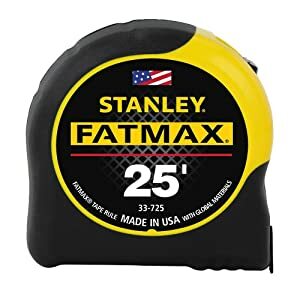 The Stanley 33-245 Powerlock 25-foot tape measure is my best pick not only because of the cheap price and good quality but also because of the fact that I have pointed above, it remains a popular tool, even if no changes have been done to it in the 50+ years of it being in the market. it has a traditional and valued design that has existed for a long time. It can be expected that a tool of a famous brand like Milwaukee makes it to my list of top tape measures. 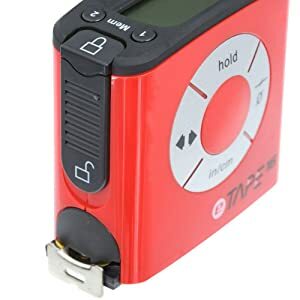 The company’s ability to produce high quality and solidly constructed tools is respected and recognized by many people and it is shown in the red branding with a lightning bolt in the measuring tape case. The case itself is simply designed, yet is strong and durable. 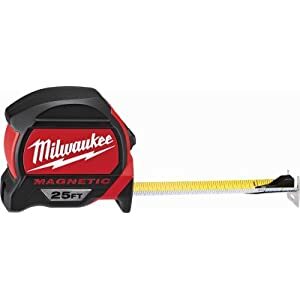 The blade of the Milwaukee tape measure, which is as simple as its case, is 1.83 inches wide and has nice and clear imperial measurement markings that are easy to read courtesy to the wider blade. The Milwaukee tool has no springs to worry about because it is a magnetic tape. That makes it a bit heavier than several others, but could also increase the length of time for which this tool can function. This is an uncomplicated measuring device, but is well built and has superior quality construction. The popular Milwaukee branding does come with a price tag though. In fact, this tape measure is one of the more expensive tools on this list. 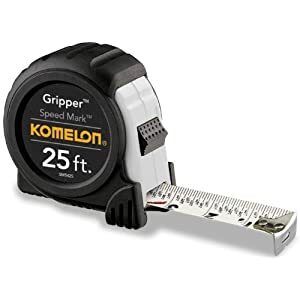 As in brands/models reviewed above, this Komelon tape measure looks very plain and simple on the outside, until you look deeper. The device boasts of some features that will surely catch your attention. 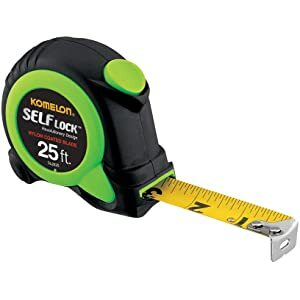 While most measuring tools’ blades are designed to automatically draw back in, the Komelon tape measure is quite the opposite. It means that you do not use the top button to lock the blade, as in other models. Instead, it self-locks as you pull out the blade. The Komelon top button actually is used to draw back the blade into the body of the device. And I find it an awesome feature. Very different and you may need some time to get used to it if you’ve been using other models. I tried to look for other features that will excite me, but there is none. The tool blade is somewhat a bit thin so that the measurements become difficult to read. The rubberized case is comfortable to the hand and prevents the inner workings from breaking, during impact. You’ll be pleasantly surprised and feel good when you see the price tag which is on the low side. All in all, this Komelon measuring tape SL2825 self-locking is a little device that has a good design and builds. the measuring blade is thin and the markings are too small, making them difficult to read. Oh well! This is my premium pick, actually. This the 21st century and the time for modern technology, so here it is – your measurement on digital screen. This eTape measuring device offers you an extremely exact measurement and it wouldn’t be too surprised if it emerges, as the most accurate tape measure available in the market. Of course, the tool also has its measuring blade and you can use it also in a traditional manner, as it has imperial measurements marked out on it. Here is an additional feature to appreciate, when using this digital measuring tape. It has both the imperial and metric measuring systems, so you can switch from one system to another, whichever suits you. If you want to re-zero your measurement, you can do it at any time, without the need to retract the tool’s measuring blade. You just press the zero button, so you can start measuring again. The escape device is ruggedly nice. While it is advertised as weather resistant, it can add to its lifespan, if you could give it a more gentle treatment. As you would expect, this tool carries a high price tag. easy to re-zero during measurements, without the need to retract the blade. the battery will need to be replaced eventually. This tape measure model’s key feature is the graphite marking tool, which has been included in the device. The graphite tool is actually a pencil and its inclusion into the case makes it possibly easy to make accurate measurement markings. With this tape measure, you can avoid using your hands clumsily looking for that pencil while holding the tool with another hand. You can use the measuring tape itself when you need to make any marking. This process results in a more accurate measurement in size or length of something that you are working on. The fact that it has a hefty price tag only means that this is the price of having an innovative self-marking feature. 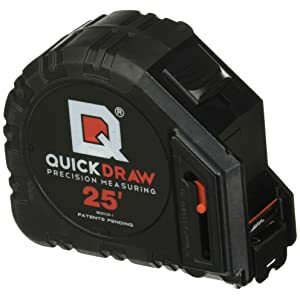 the built-in graphite marker makes it convenient to mark measurement lines. If your work requires you to measure stuff that is longer than 25 feet, as we have in this review, take a look at this offering from Magnelex. You can get 33 feet of measuring capacity from this model. This could perhaps be the longest measuring tape that is available in the market. To give you something extra, the tape is marked with both the imperial and metric measurement systems. The length and the dual markings aside, this tape measure is honestly a very basic tool. It has an average hook at the end of the measuring tape and may often slip off when you try to attach it to an edge. However, if you want that additional length on tape, don’t let this offer pass. Next up is a device that may seem simple on the surface, but actually has a number of good quality design features. To begin with, you have the outer case, which at a glance looks plain and basic, but it has a rubberized coating that you will find comfortable to hold. Not only that, but it provides protection to the device’s inner working, in cases of accidental drops from a height. All of these you can get for less than $10, which is a high value for your money. This is the second Stanley brand to make an entry to my list. The Fat Max tape measure is bigger than its brother, the Powerlock, which makes it more convenient to use in some conditions. The big size can also be attributed to the nice thick blade, which is helpful in easy reading and allows it to hold out, without collapsing even unsupported. The measuring tape is made of Mylar Polyester, a kind of nice and rough plastic film, contributing to a longer lifespan of the device. The case has a rubberized exterior and is made of ABS plastic instead of being chrome coated, giving the tool a more rugged appearance than the Powerlock. What’s truly impressive here is that the first 3 feet of the measuring tape has been reinforced, which means that it has been treated with Blade Armor, an industrial grade thermoplastic coating, same type as used in blades of Black Hawk helicopters. Number 9 on my list is a Lufkin Model, with a nice name to it – the Black Widow. The name refers to the black measuring tape of the device, which has been designed to reduce the glare in bright light conditions. In addition, the markings are in vivid and striking green color, which allows for easy reading in low light surroundings. The blade is really well designed and added to that the hook, which can grip the edges well enough for easier measurement. While it has a nice and wide measuring blade, it is also a bit thin. This means that the tape can have marks or ridges on it over time. 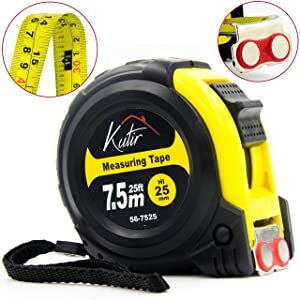 At first glance, you will think that this model of the tape measure is another simple design, with a price that is really, really low. 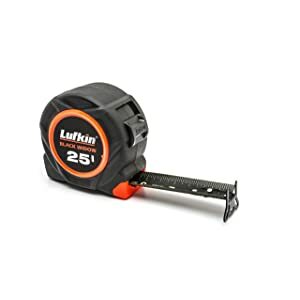 However, upon close inspection, you will easily see its key features that are worth considering, when you are thinking of buying a tape measure. The color, for instance, is white instead of the regular yellow, which Komelon says is to reduce glare and make the measurements easy to read. The steel tape has an acrylic coating. The case is rubberized, which again, makes it comfortable to hold in your hand while offering protection to the inside mechanisms. The tool is very small and with its 8 oz weight, added to the rubber coating, this is a device that is designed for efficiency and comfort in your working environment. Length of the measuring tape. As you will have noticed in this review, I focused on tape length that is 25 feet in length. This is the standard length that most people buy. For works that require more than this, you can find longer tape measures out there. In fact, one brand model on my list offers a 33-foot length of the tape. Types of measurements – imperial or metric and choice should be according to your personal preference. 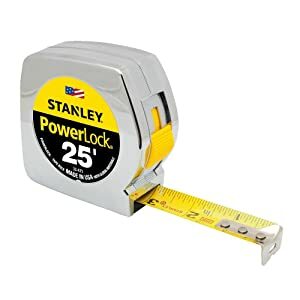 I have chosen my best pick for a tape measure, which is the Stanley Powerlock. My reasons have been stated above in Section 2. However, because choices depend on the weather you will use the measuring tape for your DIY projects or professionally, I hope that the above reviews help you in making the right decision. Moreover, no matter what tape measure you choose from my list, make sure that you are getting your money’s worth.